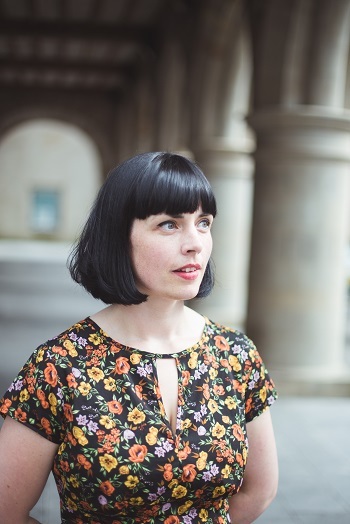 Doireann Ní Ghríofa is a bilingual writer working both in Irish and English. She frequently participates in cross-disciplinary collaborations, fusing poetry with film, dance, music, and visual art. 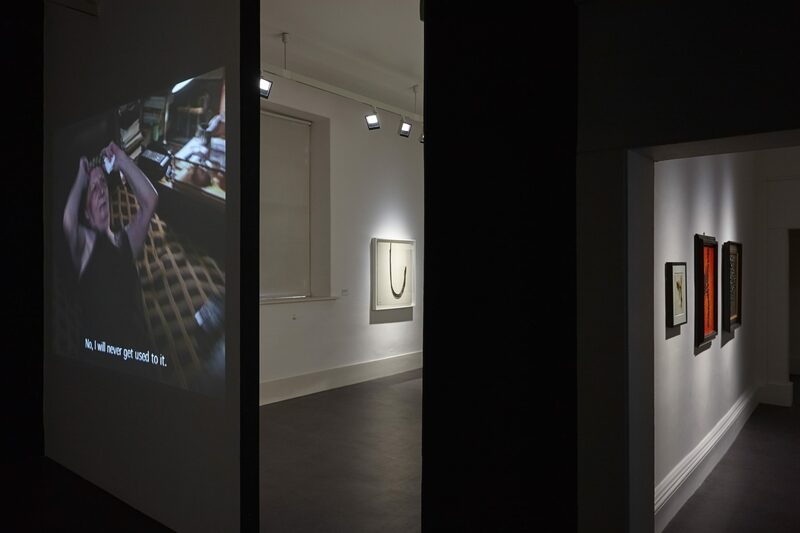 We are delighted to be able to publish, for the first time, a new work by Doireann written in response to the current retrospective of Carol Rama here at IMMA (closing 1 Aug 2016). Doireann introduces the work below, and the poem follows. 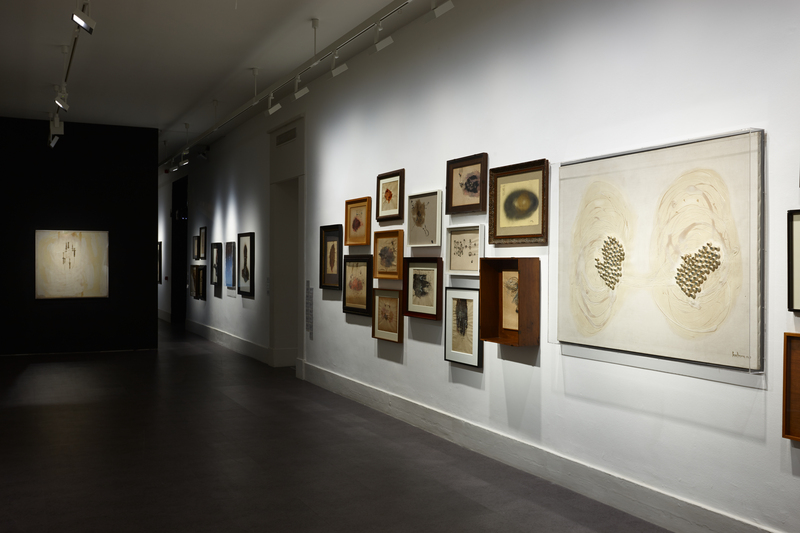 Pictured here on the far right is Carol Rama, L’isola degli occhi (The Island of Eyes), 1967, Plastic eyes, synthetic resin and enamel on canvas, 120 x 160 cm, Private Collection, Installation view at IMMA, photo Denis Mortell. A first encounter with the work of Carol Rama is a shock, a visceral jolt, an astonishment. As I walked through IMMA’s retrospective of Carol Rama’s life work, I was reminded of a quote by Philip Larkin– “Poetry is nobody’s business except the poet’s, and everybody else can f*** off.” Plucky and boisterous as she was (and no stranger to poetry herself), I feel that Carol Rama would have enjoyed this quote as applied to her art, in fact I can almost imagine the spark in her eye, her hoarse chuckle. Yet despite the irreverence of that quote, Carol Rama’s work is our business, for it challenges us, it provokes us, it questions us. If art can be considered a reflection then Rama’s work is particularly human, for here we are, in each piece, flawed and messy, muddled and bizarre. Here is the life-work of a woman with guts. Rama is an artist who was driven by her loyalty to the depiction of desire, and to the bodily urge to make and to create. Each work is a challenge, a dare. It isn’t pretty. Rather, Rama is driven to attend to her own instincts, bloody and filthy, foul and true. There is little sense here of attempting to pander to an audience, or seeking approval. Nothing about Rama is easy. It’s difficult to gaze into the glorious mess of the human psyche. I was particularly drawn to the works where the collision of her artistic drive and the physical texture of her chosen materials was strangest. Again and again, I found myself returning to one of Rama’s larger pieces, L’isola degli occhi, a work of synthetic eyes on canvas. I was struck by the sheer audacity of turning all these eyes on the viewer, to peer back at she who has dared to peer in… but it was more than that. There was something about this piece in particular that held my gaze. It gripped me. So often, words fail us when we attempt to describe the feeling of encountering an artwork that moves us. For me, this feeling is wordless, a tingle, like static electricity. Every so often (quite rarely) an encounter like this becomes for me a stimulus for my own work, and so the challenge arises to give words to the inexpressible, to somehow voice the unvoiceable. More often than not, my attempt is feeble, a failure. In this case, I spent months returning to this work of Rama’s, to all these eyes, driven to create something in response, something wild and weird enough to meet the muscularity of Rama’s work. Like every other act of ekphrasis I have engaged in, the resultant piece is a disappointment to me, artistically. Malleable though words may be, I cannot twist them sufficiently to capture the bodily tremble, the tingle that I experience standing before L’Isola degli occhi. Frustrated, I want to crumple my work, to throw it away. I don’t. Instead, I think of the retrospective at IMMA, the wild truth of Rama’s work that crowds every alcove, every room. I think of the bold, wild mess of it. In my kitchen, I keep a portrait of Carol Rama, so my eyes meet hers every day. Just do it, she seems to say, Make your work, release it. What are you afraid of anyway? each lash a shiver over the dark dot of a stare. unsung pulse, the inner twitch, the pink glitch. hidden within, jostling under our skin. We drop them one by one in a fall that goes unfelt. a new I, a new life, a new eye with a new gaze. it leads us from a trembling abundance to a life that becomes us. Blink and blink. Look again. Do. Blink and feel them peering back at you.